No one likes dirty grout, you need a grout cleaner. But which one? The problem with choosing a grout cleaner is that you don’t know whether it is going to work on your tiles. There are so many products that it is hard to choose! The interactive table of grout cleaners below and the analysis the follows will help you decide the best grout cleaner for you. We all have our own personal requirements on what makes a good grout cleaner, and so we’re here to help. Grout Sensation Tile and Grout Cleaner is a very popular grout cleaner at the moment. It is featured in television commercials and has many positive reviews around the internet. The reason I think that it’s so popular (besides it’s slightly cheesy name) is that it is a strong acid based grout cleaner. Acid grout cleaners “just work” and require little scrubbing. Few people want to spend a lot time scrubbing grout and want a quick fix. Grout Sensation will do the job, but care is need. Being a strong acid based cleaner it can etch delicate tiles and grout. This is not a risk for some people, but will really matter to those few people that it does effect. It is manufactured in the USA by the USA Chemical Corporation that focuses solely on tile cleaning products, which is a good sign. I recommend Grout Sensation as a good all round cleaner for most common bathroom and kitchen grout cleaning situations. It’s moderately priced and effective, what more do you need? This is a very easy to use grout cleaner that requires very little scrubbing on most tiled floors. It does not leave any residue or sand particles and does not leave any heavy chemical odor. It is common for grout cleaners to come in a larger screw top bottle meaning that you need to transfer it to another container before using it. I’ve come to expect it, nevertheless, it is slightly inconvenient (listen up manufacturers: pump bottles rule). Firstly, the product is made by USA Chemical Corporation who have a homepage straight from 1995 and is just as cheesy as the product name “Grout Sensation”. They look like an American company, which is good and they seem to focus on chemical cleaners, another good sign. Grout Sensation Tile and Grout Cleaner comes in a 1 quart (32 ounce) screw-top bottle. Like the other cleaning products I review, this is only for cleaning grout and is described as being suitable for ceramic and porcelain tiles. Reading the data sheet highlights that the product is acid based. It is 3-6% phosphoric acid and less than 2% hydrochloric acid. Remember your grout cleaning safety tips! Using Grout Sensation Tile and Grout Cleaner is a straightforward affair, but remember to always read the labelling yourself. You can pour the cleaner from the bottle directly. It will be a lot easier to use if you first pour it into another container such as a pump sprayer or an old mustard or sauce container. Apply to the grout directly, start with a small area say 2×2 tiles and build up your confidence with the product before expanding out into 5×5 or 10×10 tiles. Grout Sensation will bubble and foam on the grout (this is the acid doing its thing) and will loosen the dirt, mold and mildew from the grout. Wait approximately 20-30 seconds for the acid to do it’s work. You may want to lightly scrub the area with a grout brush in areas that are particularly dirty. Wipe away the the cleaned area with a damp cloth or sponge. Once you finish an area, mop with clean water. A second mop wouldn’t hurt. If you have cleaned your grout recently and are looking to just freshen it up you can create a diluted mixture of 4 parts water to 1 part Grout Sensation and follow the procedure above. If you your grout is already cleaned and you want to keep it that way, add one cup of Grout Sensation to a bucket of water and mop the whole floor. Then mop again with clean water. It’s not the cheapest grout cleaner out there (but who wants that! ), nor is it the most expensive. It’s quite moderately priced by my reckoning. Note that it is an acid based grout cleaner. It will dissolve through most grout seals to get down to the grouting to do it’s job. Nevertheless, it is good for colored grouting and is claimed to not bleach it white like some other grout cleaners. It’s acid based and if you have stone based tiles, you will have alarms going off. This is not a product for granite or marble. Neither is it a product that can be used on steel, wood or glass. Take note. It does have a slightly spamming name which I guess helps with late night infomercials. It’s a trend I’ve noticed, oh well, as long as it works. There are no special tools and no waiting a long time for the cleaner to work. This why it is so popular and highly rated, it’s simple, it meets most peoples needs and it works. It’s hard to argue with that. An average house would get by with one bottle or more per year, depending on how dirty your grout gets (how many pets and children you have!). It’s a popular product online, but also in hotels, with the marketing literature claiming to be popular in major hotels across North America. 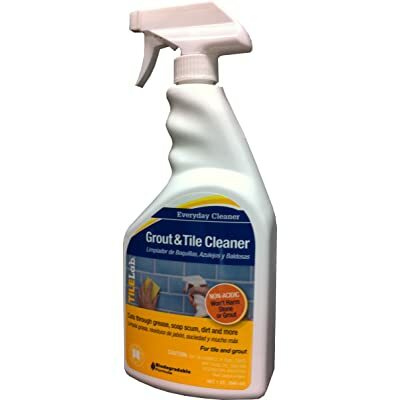 The TileLab Grout and Tile Cleaner Spray Bottle is made by Custom Building Products based in California that specialise in flooring products in general. This is a different cleaner that does not include any strong acid or bleach ingredients. This grout cleaner may require more scrubbing than some others and also requires a small wait for the active ingredients to lift the grim out of the grout. A benefit of Tilelab Grout and Tile Cleaner is that it is low in Volatile Organic Compounds and is a biodegradable formula. This means that it better for the environment than some other chemical cleaners. It also has a pleasant citrus scent. This cleaner is suitable for those that are a little worried about their more delicate tiles and grouting and do not want to use strong bleach or acid based cleaners. It is also suitable for those who want something that is slightly friendlier to the environment. A key feature of this grout cleaner is that it is low VOC (volatile organic compounds) and is a biodegradable formula. This means that it better for the environment than some other acid based cleaners. It’s not a acid based cleaner. Now this is a pro for the cleaner above, but it can also be considered a con. This is because you will very likely have to do some scrubbing work to get the most out of this grout cleaner. Whereas the more abrasive acid cleaners will chew through the grim themselves. Tilelab is made by the company Custom Building Products that have a range of tile and flooring products not limited to cleaners. Grout cleaning products is a part of their business, not their whole business like some others, but they are floor specialists. The product comes in two sizes, a 1 quart (32 ounce) spray bottle and a 1 gallon (128 ounce) bottle. As you may know, I really cleaners that come in the pump spray bottles as you don’t have to transfer the cleaner yourself into another bottle before using it. The large 1 gallon bottle can also be used as a refill for the pump bottle. You can also purchase a 3 pack of spray bottles which can be useful if you have a few targeted jobs, such as cleaning up after a tent has left. More companies should offer multi-pack bottle packages with discounts I say. One more thing on the product description, the company seems to change their packaging now and then. I don’t know if they are doing marketing experiments or there are different resellers involved, but sometimes the packaging is blue and yellow, other times orange, and sometimes all blue. Don’t be too surprised if you get a bottle with a slightly different coloured label than the one pictured. Spray onto your grout. Start with a small area suchs as a 2×2 tile square and then move up to a large 5×5 or 10×10 as you get used to the cleaner. Wait about 5 minutes for the active ingredients to work on the grout and lift the dirt. Scrub lightly with a grout brush on those really bad areas. Mop the area with clean water. Tilelab is a non-abrasive and non-acidic grout cleaner that works on tiles, grout, glass, chrome and laminates. The packaging claims that it cuts grease which is a feature that few grout cleaners claim, but in my experience I typically do not have trouble with grease in my grouting, it more stains in the kitchens and mildew and mold in bathrooms. I suspect the reference to grease may be for kitchens with counter splashbacks near stoves that might throw off grease. Finally, it has a citrus scent, which is a useful benefit meaning that you do not have to spray air freshener after your cleaning project to clear up any chemical odors (if you like citrus). Tip: Have a good supply of grout cleaning brushes on hand. I recommend at least 2 or 3 depending on the size of your cleaning project. Like most general purpose grout cleaners, this product is not for stone tiles. If you have stone tiles like marble or granite, consider a more specialised product. 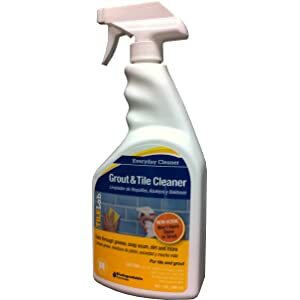 This is a good grout cleaner for those that don’t mind a little scrubbing and do want to use a more abrasive acid-based cleaner. It is positively reviewed for those looking for something a little more environmentally friendly and don’t mind a little elbow grease. It also has a pleasant citrus scent. In this post I want to review the Black Diamond Ultimate Grout Cleaner product. This is a cleaner that I heard of a while ago and I’ve been keen to discuss. 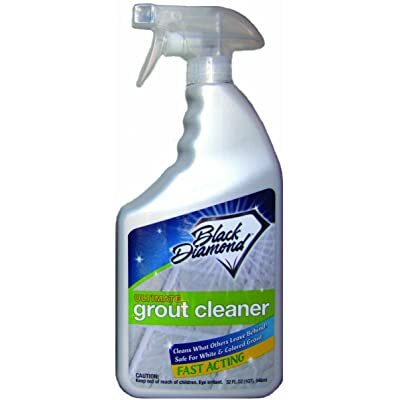 I note that there are at least two related products from Black Diamond, and they are the Ready To Use grout cleaner or RTU and the concentrate grout cleaner. In this post we are concerned with the Ready To Use Grout Cleaner product. As a solvent based grout cleaner, it may be more suited to grease based dirt and grime in your grout, such as on your counter, counter splashback and other places in your kitchen. It is not an acid based cleaner as mentioned, so it may require some light scrubbing with a brush to be effective. The manufacture for Ultimate Grout Cleaner RTU is Black Diamond Stoneworks. They were founded in 1997 and produce a range of 30 cleaning and sealing products for stone and ceramic tiles. There are a few key points you notice about this product right off the bat. It comes in a 32 ounce (1 quart) pump spray bottle. I’m found of these bottles for their of application of the grout cleaner. Also, the this product is acid free. As soon as I read they I think bleach. Interestingly, this product has a trick up it’s sleeve. It actually includes a weak base (Monoethanolamine) and a solvent (Dipropylene Glycol Butyl Ether) as the active ingredients. Spray the cleaner on your grout using the pump spray bottle. Let the cleaner sit on the grout for 1 to 3 minutes. Scrub lightly with a grout brush on difficult stains and particularly difficult areas. Wipe away the cleaner from the grout with a damp cloth or grout sponge. Mop the area thoroughly with fresh clean water. Black Diamond Ultimate Grout Cleaner is not an acid or a bleach based product and is safe to use on both white and colored grout. I also note that the product has a slight sterile smell. Nothing offensive, but noticeable. Black Diamond Ultimate Grout Cleaner is a deep clean product rather than an everyday grout cleaner. Given that it doesn’t use strong acid or bleaches, it is a great product for those that are concerned about damaging polish or delicate grout. 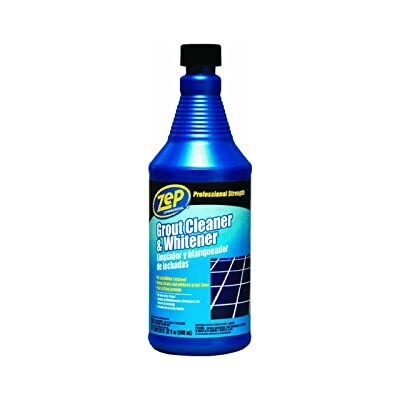 Zep Grout Cleaner and Whitener is another one of those grout cleaners that seems to pop up everywhere and I can tell you exactly why that is. Zep Grout Cleaner and Whitener is an acid based cleaner and the major benefit of these types of cleaners is that they are very effective with very little scrubbing. It makes them ideal for bathroom and shower grout that needs some serious attention. The product is not appropriate for stone tiles, or metal. If you have marble or granite tiles seek out a specialised grout cleaner. If you accidentally get some of the cleaning liquid on metal or anywhere other than the grout you want to clean, wash it off with fresh clean water as soon as you can. The Zep Grout Cleaner is a little faceless. It belongs to a brand called Zep Commercial which in turn belongs to Zep Incorporated and I’m sure that is not the end of the story. The home page talks about all the myriad of cleaning products that the company (brand) sells. There is reference to Atlanta, Georgia and that may be the location of the organization head office. Zep Grout Cleaner and Whitener is a detergent and acid based cleaner and if you are a regular reader you will know what that means! It explains the popularity and it means that it is bleach free (a fact that is advertised). The acids used in this cleaner as described in the MSDS are hydrochloric acid and hydrogen chloride. It comes in a 32 ounce (1 quart) bottle that has a applicator nozzle on the top. The liquid grout cleaner has a sassafras scent. Wear gloves and safety eye wear. This is an acid based cleaner, and you need to take care of your skin, eyes and clothes. Apply the grout cleaner to the grout only. The bottle comes with a nozzle so that you can pour it into the grout. The bottle is large and heavy (1 quart!) so take it slow and steady, or consider transferring some liquid into another bottle for easy application. Start with a small area, such as a 2×2 square, and then graduate to a 5×5 or 10×10 as you increase your confidence with the product. Let the liquid set in the grout for 2-3 minutes. The acid will eat the tiny surface of the grout and loosen the dirt, grime and mold which should become loose. You may need to scrub lightly at difficult stains with a grout brush. Wipe the cleaner away with a damp cloth or grout sponge. Mop the area with clean water to remove the cleaning product. Zep Grout Cleaner and Whitener is an acid based cleaner, it means it does not contain any bleach and it can be used safely on colored grout. It has a pleasant sassafras scent. More cleaners should have a scent, especially the strong ones. Zep is a chemically strong product, like all serious cleaning products, make sure you have good ventilation and take breaks so that you do not exert yourself. There are many positive comments about Zep Grout Cleaner and Whitener, people really like the product. The reason is simple, because it is so easy to use: pour it on and wipe it off. This is the benefit of all acid based grout cleaners and this Zep is no exception. You need a grout cleaner that is right for you. That means you need to think hard about what you are looking for in a grout cleaner and find a the product that best fits those needs. Location. There are grout cleaners that are intended to be poured over the floor and left to soak and may be suitable for bathroom floors and shower bases. There are others that are intended to be strategically applied to just the grout and scrubbed and may be better suited to counter tops and counter splashbacks. The room where your tiles are can limit the types of cleaners you can use. Acid: These are chemically strong cleaners that typically require less scrubbing (if any at all). The acid essentially eats away at the top level of the grout sealer and very quickly lifts away dirt and grime. Bleach: These are also chemically strong like acids and typically require less scrubbing. A bleach is chemically known as a strong base (think of it as the opposite of an acid). They remove color and are more suited to white grout and white porcelain in bathrooms and showers. Other: These grout cleaners use different active ingredients and may include organic forms and weaker forms of acids or bases (such acid from citrus). These types of products can require more scrubbing with a grout brush because they are chemically abrasive, but are less harsh to the tiles and grout and can be friendlier to the environment. A good source of detailed information for a cleaner is to read its Material Safety Data Sheet, something required for each cleaner sold in the USA. This information is very technical, and rest assured that I read it carefully when I review each grout cleaning product (so that you don’t have to). Always read the label on your cleaning products and understand the types of tiles and even the type of grout you have. This knowledge can save a lot of time. Some types of tile can be damaged by strong grout cleaners (such as etching away the polish on stone tiles) so this knowledge can even save you costly problems down the line. Grout cleaning can be dirty work, but it can also be hazardous work. It is important that you take appropriate precautions to protect yourself and your family when undertaking any serious cleaning effort. In this post I list five safety tips when cleaning grout. They may seem obvious (and they are) and you may know them already (you will), but it is so very easy to jump straight into scrubbing. We want clean grout, we don’t want a trip to the emergency room. Many grout cleaner products use bleach, acids and other harsh chemicals. These dissolve the mold and muck in your grout but can also damage your skin, in some cases even give you a burn. Always wear rubber gloves when cleaning grout. 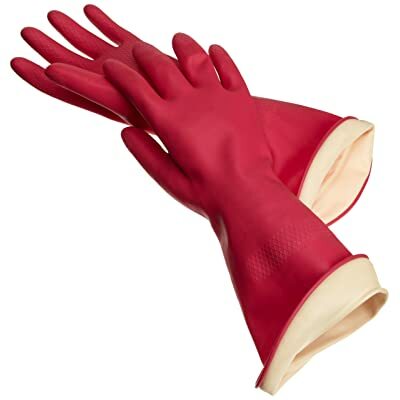 Use thicker gloves when scrubbing to avoid glove tearing or the chemicals leaching through. Consider thinner gloves when wiping away muck or using a mop for better dexterity and control. If the cleaning products can dissolve mold and muck in your grout and are not good for your skin, imagine what it can do to your eyes. 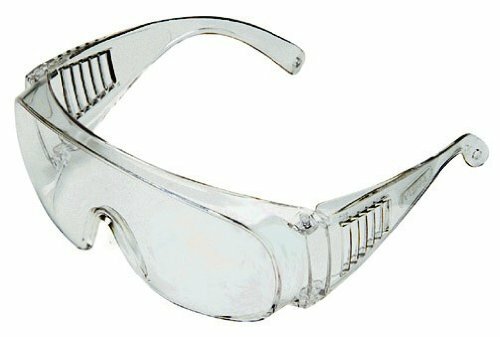 Do not take any chances, always wear some kind of protective eyewear such as safety glasses. We have a pair hanging on a hook that we use just for this type of cleaning work. The strong chemicals used in many grout cleaning products can release fumes. Breathing in these fumes for an extended period can make you feel light headed, sick to your stomach and even worse, could damage your respiratory system. 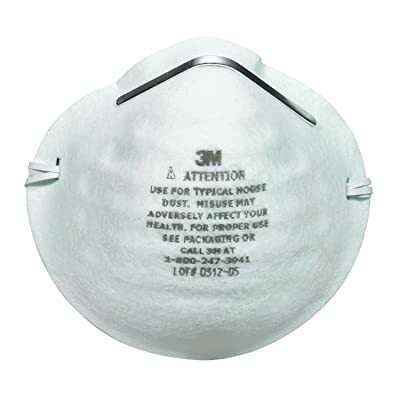 Consider wearing some kind of breathing protection, like a cleaning mask. Open all the windows in the room you are cleaning. Leave the door to the room open at all times and put on any exhaust fans. I like to open the whole house (all windows and doors) when I’m cleaning and flush the house with clean fresh air. Somehow it makes the house feel cleaner to me. Mixing chemicals from different products can be very dangerous. There are cases when the results can be poisonous or even deadly (mixing bleach and ammonia is a well known example of a very dangerous combination). Always carefully read your cleaning products and understand what the active ingredients are. Be mindful of other products you would like to use at the same time as your grout cleaning product and investigate with manufacturers, hardware stores or even online that that the two products are not going to have an adverse reaction. There are cleaning products that need to soak into the grout before you clean them. You do not want your toddler or puppy coming along and taking an interest in the pools of water and chemicals. Find a way to keep children and pets well away from your cleaning operation until you finish completely. I put the pets outside and get my better half to mind the children and keep them down the other end of the house any time I go on a cleaning spree. Pro Tip: I am super geeky so I have a little safety checklist taped up on the inside of our chemical cupboard so I am reminded each time I tackle a cleaning project at home. Do you have an idea of what the best grout cleaner is? Leave a comment.